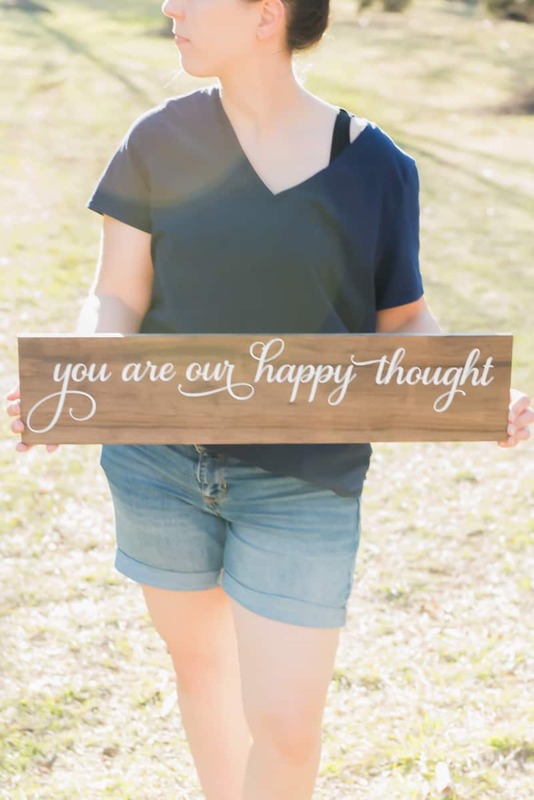 You can make this wooden nursery sign two different ways with your Silhouette Machine! When I first found out we were having a little boy I couldn’t wait to do a Peter Pan themed nursery. I had all the plans in my head; paint color, decorations, and wall art danced through my dreams nightly. But then I realized that we couldn’t paint because of our lease and that we had no room in our two bedroom apartment for a full furniture set and rocker. So I had to improvise and do what I could. I had dreamed of a gallery wall with my favorite quotes from the movie, pictures, and other Neverland inspired things. But time got away from me and it just never happened. But I’ve slowly been gathering things for it, and this weekend I finally made the wooden nursery sign I’ve been thinking of for months now! Maybe I love Peter Pan because he’s the boy who never wanted to grow up (I mean, who does really?) or maybe it’s because I have a ton of memories of the ride at Disney World from when I was a child. Either way, I want to pass on that love of the story to my child and I figured decorating his nursery with the theme was a good way to do it. Though, he’ll probably grow up and hate it just because I want him to like it. That’s how I hear things work as a parent. Kids never like what you want them too! This wooden nursery sign is just the beginning of a long line of projects that I’ve been dreaming up for a year and a half. I would say that this sign got me pumped up for more projects but it was kind of the opposite. I had such a hard time cutting the stinking vinyl and I wasted a ton, but I finished the wooden nursery sign and that’s all that matters (right?). Really though, the blade either cut through the vinyl or it didn’t cut it at all. And I have no idea why. But at least that gave me an excuse to write out how you could do this project two different ways and get two different looks with it! How to make a Wooden Nursery Sign with your Silhouette, two ways! Font: I used the Samantha font to write out the quote in the Silhouette Software. + Load your permanent vinyl into your Silhouette and check your cut settings. Once you have everything set go ahead and cut your vinyl. Once it’s cut, weed it and set it aside. + Cut a piece of transfer tape for your saying. Lay it on top of your vinyl and then (using a Silhouette tool, like the scraper) rub the transfer tape onto the vinyl. Pro Tip: I love the grid paper from Expressions Vinyl so that you can easily line up your vinyl! + Start to peel up the transfer tape carefully, making sure that the vinyl comes up with the tape. If it does not, lay the tape back down on the vinyl and rub it again. Continue doing this until the entire quote comes off on the transfer tape. + Lay the transfer tape down on your wooden board and then rub the vinyl into the wood. Peel up the transfer tape (same as the step above) while making sure that the vinyl sticks to the wood. If it does not, follow the above step until it does. + Load your stencil vinyl into your Silhouette and check your cut settings. Once you have everything set go ahead and cut your vinyl. This time weed the letters of the quote leaving only the outline of the words. + Cut a piece of transfer tape for your saying. Lay it on top of your vinyl outline and then (using a Silhouette tool, like the scraper) rub the transfer tape onto the saying. + Start to peel up the transfer tape carefully, making sure that the vinyl outline comes up with the tape. If it does not, lay the tape back down on the vinyl and rub it again. Continue doing this until the entire outline comes off on the transfer tape. + Lay the transfer tape down on your wooden board and then rub the outline onto the wood. Peel up the transfer tape (same as the step above) while making sure that the vinyl outline sticks to the wood. If it does not, follow the above step until it does. + Next, paint a very light layer of mod podge over the stencil. This will ensure that your paint doesn’t bleed underneath. + After the mod podge is dry paint a very light layer of chalk (or acrylic) paint over the stencil. Let it dry and then peel up the stencil. If you have any bleeding at all (if you do it’ll be minimal) you can sand the paint down a tad to give your sign a more rustic look. If you are obsessed with Disney crafts, check these out! I’m thinking that I may hang pictures from this sign for his second birthday. It would be a cute birthday decoration and a fun way to show off all the memories we made the past year! What is your favorite Disney movie quote? 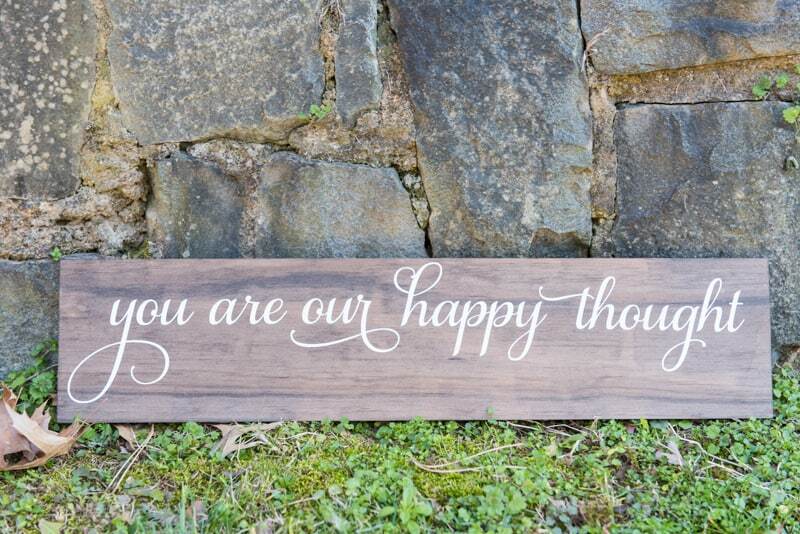 Would you hang this wooden nursery sign in your child’s room? Get more vinyl project ideas! This is such a cute sign! I thought about making Greyson’s room a “lost boy” / “Neverland” themed room and this would be perfect for that! Love it, I just got a circut for Christmas, which I have yet to break open. Too busy, but one day I’ll break it open! How did you get the wood piece? Did you paint that? Great job! I love this sign, it is so cute!! I love the idea of a Peter Pan themed nursery!